Beautiful colors, the cactus always make such great silhouettes. This is beautiful! I really like the setting sun just visible through the vegetation, very nice! Really gorgeous! I keep wanting to move up and see the top of the foreground cactus and a little less of the black bottom. Still, the colors and setting really give a relaxed, "want to be there" feel to the shot. The clouds are just right to get the size of the cactus to fit well with them. Did you shoot one with less dark space at the bottom? Excellent sunset shot, with classic desert clouds. Beauty Az sunset. Great capture. Beautiful! 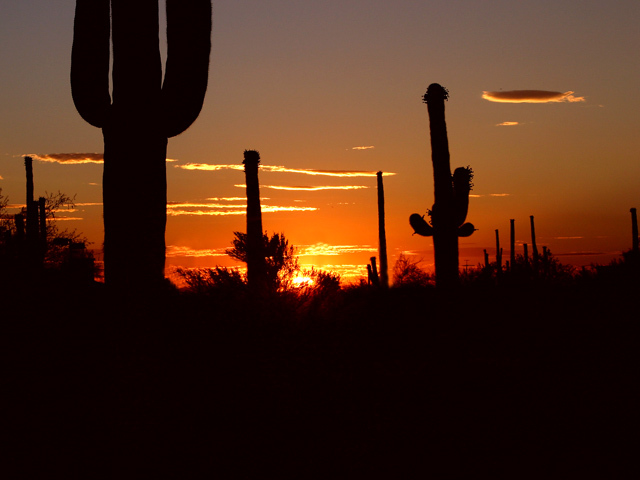 Those Saguaro make for a picture perfect foreground. I tried to get something similar in my recent trip but no such luck. Proudly hosted by Sargasso Networks. Current Server Time: 04/18/2019 06:21:26 PM EDT.